In a medium bowl, combine ground beef, steak seasoning, Worcestershire sauce, garlic powder, 2 tablespoons parsley and 2 tablespoons chives. Mix until combined. Form meat into 16 mini burgers. Grill for 10 minutes or until cooked through, turning every few minutes. Place slices of cheese on meat for the last minute of cooking time to melt. Meanwhile, make dipping sauce. In a small bowl, combine mustard, mayonnaise and remaining 1 tablespoon parsley and remaining 1 tablespoon chives. Stir until combined. Reserve. 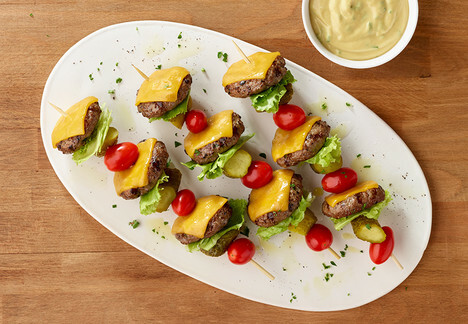 To assemble the skewers, take the skewer and pierce the tomato, pushing it to the top, followed by the pickle, lettuce and then the burger at the end. Dip into sauce and enjoy!